The Local Government of Sta. 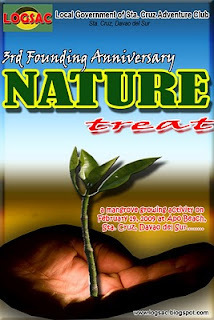 Cruz Adventure Club will be having a nature treat on February 19, 2009 relative to its 3rd Founding Anniversary. Highlight of the occassion will be a mangrove-growing activity on February 19 at the vacant swamps of Apo Beach, Poblacion Zone 3, Sta. Cruz, Davao del Sur. Approximately 300 mangrove propagules will be planted, grown and to be taken cared of until it reaches level of stability. Following its successful anniversary clean up drive at Tudaya Falls last year, the group decided to plant mangroves this time considering that there is an immediate need to rehabilitate the environment especially in the coastal areas.